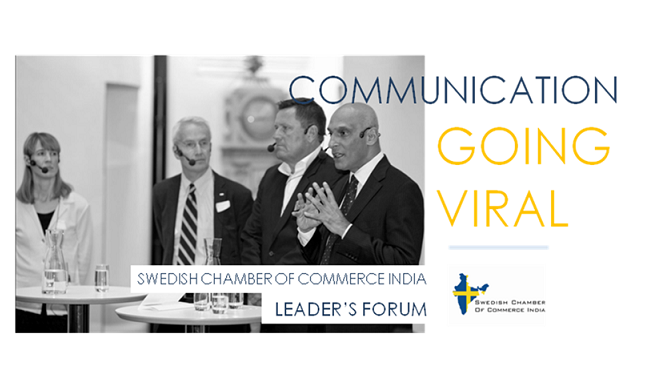 Since 2013, the Swedish Chamber of Commerce India has organized Business Leader’s Forum within different areas such as HR, Communication, CSR and Manufacturing. The purpose of each Forum is to create a platform for Functional Leaders amongst the member companies to come together and share best practices, get inspired and create synergies by bringing together the diversity, experience and knowledge within the community and propel us into the future. We’re part of a digital and social revolution. Collaboration platforms, communities and internal social networks are exploding. Boundaries are blurring. The power of voice is changing hands. Today digital is no longer a distinct medium, or a merely a ‘nice-to-have’ one. Employees expect to interact with leaders, each other and the external world online, via the latest intranets, and platforms like Yammer and SharePoint - and in ways that offer a relevant, engaging and informative experience. For internal communicators, it’s both the greatest opportunity and challenge of a new era. At this forum we invite you to share ground-breaking tools, processes and systems that have helped you redefine your digital and social media strategy, skills, networks and governance, examples where you can see that online has effectively unleashed the potential and get ahead of the curve. Ms. Sofia Eriksson, Head of Communications, Ericsson India Global Services will share Ericsson’s strategies towards internal communications. We also look forward to hearing about your company’s best practices during the forum and hope you will stay on and join us in the Glögg celebrations starting at 6.00 pm! Please register here to RSVP your confirmation.